Cambridge station used to be an easy station to use, in that, when you arrived, you either got a taxi from outside the station or walked across the road to get a bus to the centre. Since the dreaded busway has been built, the buses are about as well-organised as the Labour Party, with information designed to confuse visitors. Yesterday, it was particularly bad, when I decided to pop in to the City to have a coffee with a friend, on my way to football at Ipswich. There wasn’t a bus in sight and the queue for the taxis was totally blocking pedestrians wanting to get out of the station. In fact, I took about five minutes to actually get off the platform as it was so busy. In the end, I walked into the City Centre. Getting back, I was running late, so I decided to take a bus. But could I find one? No! So in the end, I took a taxi, which had to take a very roundabout route. Getting into the station was just as bad as getting out had been, but I caught my train with a couple of minutes to spare. The train is the big improvement on the line between Cambridge and Ipswich. In 2010, this was a typical train on the route. 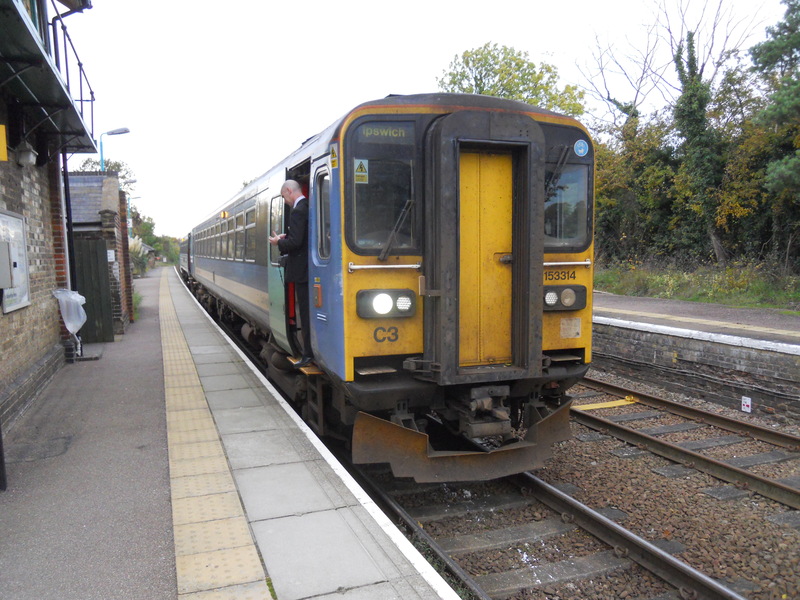 At least that day, it was two Class 153 trains, when often it was just one crowded carriage. 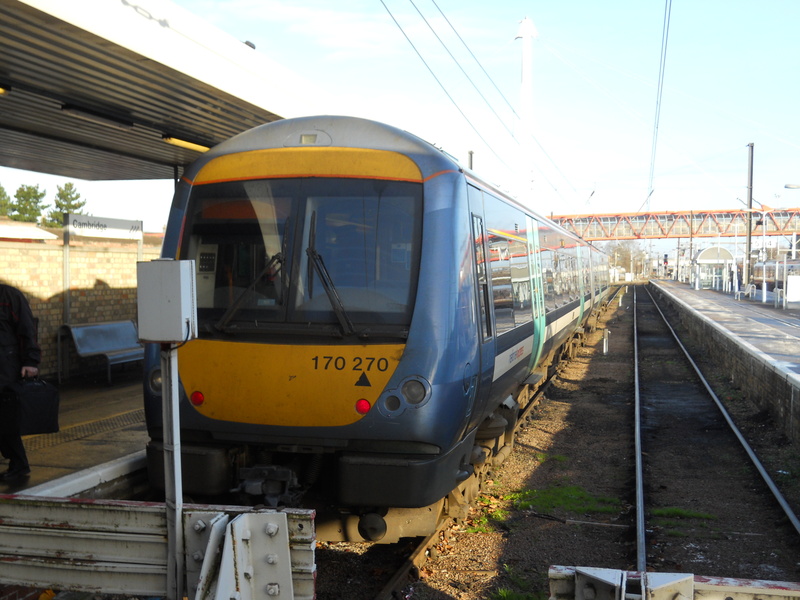 Yesterday, the train was a comfortable three-car Class 170 train. This is a lot better and with the new franchise in October, I think it could be signalled, as getting better again. But all of this increase in capacity, is straining Cambridge station even further. At present, the problems at Cambridge seem to be caused by too many people going in different directions, whose routes seem to conflict with each other. Many of these are first time visitors and foreign topurists, who just wander aimlessly around, causing even more conflict. Cambridge North station, when it eventually opens, might help, as many will cycle and drive to the new station. It will also make it a lot easy to get to the North of the City. I think, that if most Cambridge trains serve both stations in the future, I’ll go to Cambridge North and get a bus into the City Centre to avoid the scrum at Cambridge station, which I’m sure will get worse, as more and more trains are scheduled between London and Cambridge. At least Thameslink have decided to go to Cambridge North. One of the problems is that Cambridge station is on a cramped site, which is not an easy walk to the City Centre for the average visitor. The walking route to the centre is along Station Road and then Hills Road, where the payments are crowded and not very wide. It is my view that something radical needs to be done. But Cambridge’s problem is not unique and getting from the station to the town or city centre is a problem in many places like Bristol, Leicester, Norwich and Oxford to name just four. Nottingham and Sheffield have used trams to solve the problem, but I don’t think that would work for everyone, as the disruption of building would be just too much. So what would I do at Cambridge? It must be a nightmare living on the South-East side of the station opposite to the main station buildings. An entrance on the other side of the station would surely help. If you take Euston, Kings Cross, Liverpool Lime Street, Sheffield and a few other stations, the area in front of the station has been turned into a public space, so that people can gather their thoughts and plan their next move. 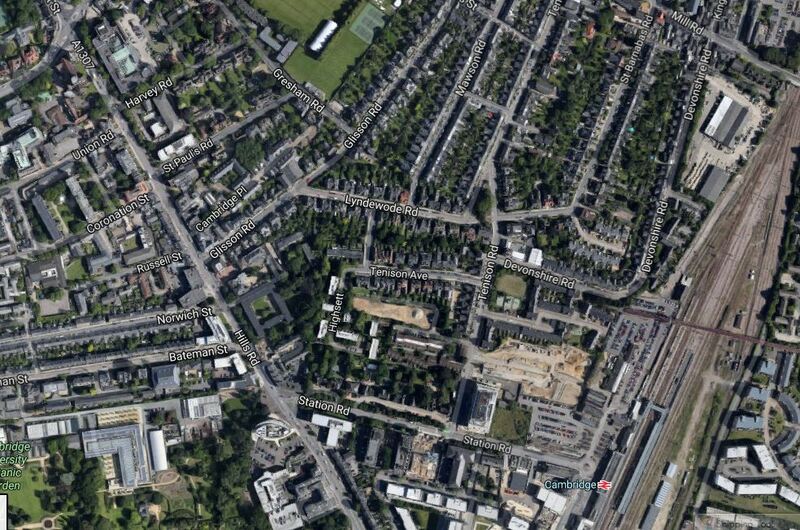 It would appear from the amount of building at Cambridge station, that this is now impossible. A decent walking and cycling route to the centre must be created. In the future, I feel that Cambridge probably needs an innovative Street Tram, as do many other places. It would have the following characteristics. It would be battery-powered and charged at each end of the route. It would be double-ended, so it would just reverse at the end of the route. It could be on rails or rubber tyres on a single-line segregated track. The vehicle would have three or four segments to give a high capacity. It doesn’t have to be single-deck vehicles. Why not double-deck vehicles with panoramic windows for tourists? If a passing loop could be built at half-way then the route could be run by two vehicles. Or in Cambridge’s case perhaps a different route could be used in each direction. The nearest thing to what I have described is the 1.4 km long MetroCentro in Seville. I would feel that a track-less solution based on bus-technology might be better, as in a congested City Centre ;like Cambridge the route could be flexible.